Come now, my readers and let us go back down memory lane... from me, at least. 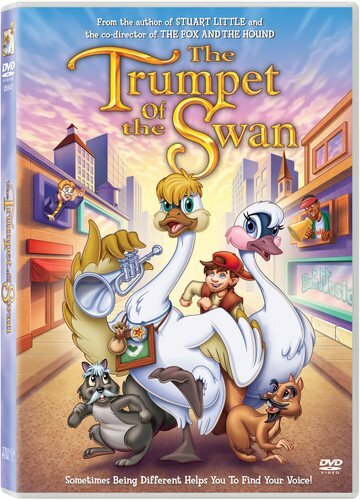 I remember reading "The Trumpet Of The Swan" when I was in the fourth grade. I don't know why, or what about it, but I enjoyed it a lot. I then remember as a school assignment I had to write a sequel. In typical Zach nature, it sounded much like a big budget action movie. But now I'm getting off topic. In either case, I was looking forward to revisiting the story in movie form, as I did forget some of the story. So what is the story? The story deals with alienation and being different, and begins when three baby swans are born to swan parents. However, one of their swan children, Louie, can't speak at all. This causes some trouble for him, and during some misadventures, Louie learns that he is special and that despite his flaws that he can't help, his own voice rings loud and clear to those around him. Yep, it's a moral that all kids should learn... about being different and accepting those different. Then there that's other moral about how we are special in our own ways. This movie is not bad by any means, but when you compare it other studios who have churned out animated feature films, or the mega Disney empire, it does pale in comparison. Still, I do think children will enjoy it and it could be far worse. The movie is also short, so it's rather a painless experience for older ones who may be forced to subject this. For a movie that went to video rather quickly and got limited theatrical run, it did attract a pretty big name voice cast. The cast here is pretty spectacular and give much feeling and life to the characters. Jason Alexander, who has done a lot of voice over work, does a strong job as Louie's father. The likes of Mary Steenburgen, Joe Mantegna, Seth Green and Carol Burnett also do good jobs. And while Louie doesn't talk, he has a voice over voice for what he is thinking. Still, I found a lot of the sensibilities from the book lost, and jokes and little characters to appeal to kids. That's not bad, but I suppose it's not being totally true to the book. It loses some of the charm and feeling and adds its own, and that can be good or bad depending on how you look at it. The animation is decent and flows, but is not highly detailed. There are also some cheesy, downright annoying songs. If you're looking for something that isn't mindless to let your kids watch, you can't go wrong here and they'll probably enjoy it. Personally, I'd set them aside and read the actual, far more superior book to them. Columbia/Tri-Star has decided to please both camps as they included a 1.33:1 full screen transfer and a 1.78:1 anamorphic widescreen transfer. While kids are sure to prefer the full frame, it's nice that they included both. Both transfers have great source prints, as I didn't notice any blemishes, scratches or pieces of dirt. They're spotless, and the animation looks rather rich with its bold colors and smooth flow. Black levels and detail are good, but the main problem with the transfers is that contrast is way to high. It's not that annoying, but does ruin things to some extent. Still, everyone should be pleased here. An English 5.1 Dolby Digital mix is included here, in addition to Dolby Surround tracks in French and Spanish. The 5.1 mix here is rather good, as it gives off nice effects of the birds flying, the loud crashes and probably most importantly, the music. The music is well mixed through the channels and gives a good experience. .1 LFE is surprisingly good too. Overall, very pleasing. English subtitles and closed captions are included on the release, plus Spanish and French subtitles. The DVD game Can You Guess The Sound? is strictly for kids. It's a matching game. You hear a sound, you pick the instrument and then get a congratulatory remark, and then treated to live-action footage of the instrument being played plus a fun fact. It's nice to teach kids about music. We are treated to some Bonus Trailers. We get the theatrical and teaser for "The Trumpet Of The Swan," and trailers for "Stuart Little," "Buddy," "The Adventures of Elmo in Grouchland," "The Adventures of Milo and Otis" and finally, "Thomas and the Magic Railroad." Hey, might as well adverise! Finally, another section for kids is the DVD-ROM section. There, kids can get printable cut-out puppets, printable coloring book pages and a nice supplement as far as the story's themes, entitled "Who is unique?" This is an animated film that won't win any awards or get much notice, but if you liked the book or have kids, it's worth looking into. While children will care less about the nice transfer and good 5.1 mix, the features are rather lacking, but the cheap price makes up for it. This is a title worth looking into though for some decent family fare.